No matter what you wish to accomplish fitness-wise, you’re most likely going to need dumbbells to do it. If you can’t or don’t want to join a gym for whatever reason (and that’s totally fair), you’ve gotta invest in at least a few dumbbells for your home use. You’ll run into problems when it’s time to level up or switch to different exercises as you progress through your fitness journey, so it’s better to have too many choices with regard to weights available rather than too few. Unless you’re the owner of a commercial gym or personal training studio, you’re wasting time and money if you invest in a full set of individual dumbbells in all the weights you could possibly need. Who wants dozens of dumbbells taking up all spare space in their home gym, or worse yet, lurking underfoot collecting dust and posing a tripping hazard? That’s where adjustable dumbbells come in. Designed to solve the problem of the expense and space-gobbling inherent in traditional single-weight dumbbells sets, adjustable dumbbells sets are the home exerciser’s good friend. 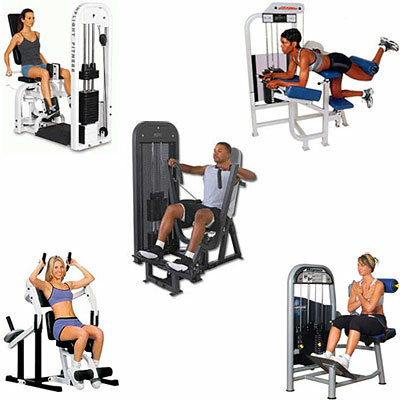 They are also a great choice for small personal training studios, group fitness classes, and mobile personal trainers who don’t want a bunch of dumbbells constantly clunking around in the backs of their cars. Which Adjustable Dumbbells Sets are a Good Investment, and Which are Junk? We’re going to get that out of the way first by taking a look at the top 5 best adjustable dumbbells sets on the market today so you can save time, money, and hassle messing around with sub-par products. After that I’ll overview why you need dumbbells in the first place, and finally I will break down the benefits of adjustable dumbbell sets over traditional single-weight dumbbells. And at the end of this post you will find a certified personal trainer’s honest take on the five best adjustable dumbbells sets for your home gym, personal training studio, or mobile training business. I’m going to share with you my top five picks for adjustable dumbbells sets for your use in your home gym or as a mobile or small-studio-based personal trainer. I’ll be sure to point out which are the fancier models and which are the most budget-friendly to help you make a choice that matches your lifestyle. I’ll also note which ones offer heavier resistance choices and which are on the lighter side. Note that while there are many solid plate-loaded and collar-secured adjustable dumbbell sets out there, I’m going to focus (mostly) on the more modern options that offer the quickest and most seamless transitions between different resistances. We don’t really need to be messing around with screwing and unscrewing collars and taking plates on and off of handles manually when we have at our disposal so many “plug and play” options that use peg-and-hole-based or dial-driven technology rather than traditional plates and collars. So without further ado, here’s a look at what I consider the top 5 best adjustable dumbbells sets including which choices will best suit different budgets. 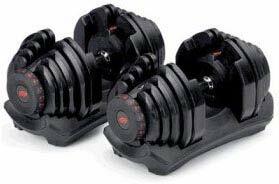 These slick and modern adjustable dumbbells from Bowflex allow you to access resistances from 5 pounds all the way up to 52 pounds for each dumbbell in the set for a combined total of 104 possible pounds of resistance. They adjust in 2.5 pound increments for the first leg of the journey up to 25 pounds, then 5 pound increments subsequently. I like the look and feel of the Bowflex SelectTech 552s. They adjust between resistances very quickly by simply placing them in their stand and turning a dial. You’ll have minimal downtime between exercises, which is awesome if you’re circuit training. The Bowflex 1090s utilize the same concept as the 552s, but offer heavier resistances: from 10 pounds up to 90 pounds for each dumbbell in increments of 5 pounds at a time. The 1090s have most of the same benefits as the 552, but they are generally sold individually rather than as a set like the 552s. They are a bit pricier but well worth the additional cost if your resistance needs are running on the heavier side. 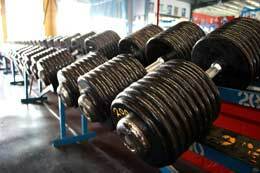 If you’re a real heavy lifter, you’d do better with two 1090s and maybe a set of 5 pound dumbbells on the side for specific isolations instead of a set of 552s. The PowerBlock Elite Dumbbells feature an innovative square-sided design that stays put exactly where you set it down, rather than requiring a stand. Different base weights are available: starting at 5 and up to 50, up to 70, or up to 90. You can also buy expansion packs if you’ve started with one of the lighter models and find yourself wanting more. 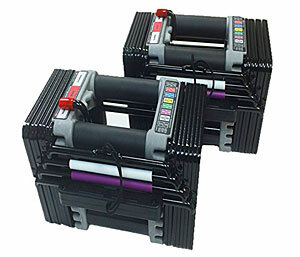 Users agree that the the PowerBlock Elite Dumbbells are extraordinarily solid in their construction, and should pose no risk of breaking under reasonable use even if you’re using them every day and even if you use them as push up handles. The Yes4All Adjustable Dumbbell options are a little more traditional but more affordable when compared to the Bowflex or PowerBlock options we’ve gone over above. Instead of featuring pegs or dials, these are your classic plate-loaded and collar-secured dumbbells. If you like more of a classic feeling of security with fewer moving parts, you might prefer this more traditional style of adjustable dumbbells. The priciest, heaviest set that goes all the way up to 100 pounds each and 200 pounds net total will still set you back less than comparable resistances in the Bowflex or PowerBlock sets, so if you don’t mind some downtime between exercises as you unscrew collars and manually swap out plates, you would love the Yes4All Adjustable Dumbbells. They don’t include a stand, so be prepared to buy one if you want them to stay put on hard, uneven floors instead of rolling all over the place. If your resistance needs are on the lighter side (for example, you’re using them for at-home rehab), or you want a small and light adjustable set for accessory work, you’ll do great with the budget-friendly ProForm Adjustable Dumbbell Set. 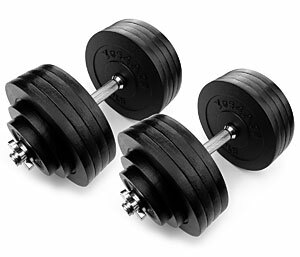 Note that these dumbbells have a COMBINED resistance of 25 pounds, and each individual weight only goes up to 12.5 pounds. The ProForms are adjustable in 2.5 pound increments from 5 pounds up to a total of 12.5 pounds each. ProForm also makes an individual dumbbell that you buy one at a time that goes from 5 to 25 pounds in 5 pound jumps, so if you bought two of these, you’d be all set to work up to a combined total weight of 50 pounds (25 for each hand). All types of the ProForm Dumbbells include a little floor stand so they’re not just sitting there smooshing into your carpet or marring your wood floors. Why Invest in a Dumbbell Set for Your Home Gym? For all the reasons already mentioned above, a complete dumbbell set is not a luxury but rather a necessity when you’re setting up a well-stocked home gym. You can certainly accomplish a lot with a plate loaded barbell set (and my ideal home gym setup most definitely includes a plate loaded barbell set as well), and various home gym models such as the Total Gym or Bowflex home gyms offer lots of movement patterns and resistance choices, but if you’re only going for one or the other, get the dumbbells. When compared to a barbell/plate-only setup, dumbbells will prove more versatile in terms of the exercises you can do, while also ensuring that you work both sides of your body evenly rather than letting your strong side overcompensate for the weak side. And when compared to home gyms, dumbbells cover bases that a home gym can’t, such as the most functional forms of loaded deadlifts, squats, and lunges. What’s the Point of Adjustable Dumbbells Sets? If you’re serious about your home strength training program, you need to train in a way that ensures progressive overload. That means when you adapt to a certain amount of resistance for a certain exercise, you need to add more weight (and/or cycle your rep scheme) to keep making progress. Our bodies only adapt to the specific stresses we put them through. We require more stress, that is, more training volume and more weight to overcome, to keep getting better with time. Keep doing the same thing forever, and you will stop gaining strength, building muscle, and losing body fat. You will hit a plateau, a frustrating condition loathed and feared by exercisers the world over. You can’t be willy-nilly with your weight selection if you want to make progress. 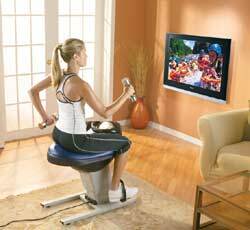 You need to dial in the specific weight you need to overload your muscles, and this weight will be different from exercise to exercise. If you’re going to do serious dumbbell training at home, you have two options: buy a complete dumbbell set in different resistances in five pound increments starting from five pounds up through however high you can go for the heaviest exercises (probably dumbbell deadlifts), or buy one or two sets of adjustable dumbbell sets that allow you to dial in specific increments of weight with just one product. For my money, I’m with the adjustable dumbbells sets. As a personal trainer, I don’t want to devote my money, space, and time to buying, storing, transporting, cleaning, and managing the dozens of individual dumbbells I would need to ensure my and my clients’ progressive overload. I’d rather have a good set of adjustable dumbbells to keep my life on the simpler side. Additionally, buying a solid set of adjustable dumbbells can save you a TON of money compared to buying all the individual resistances, which only get pricier the heavier you go. What Types of Exercises Can You Do With Dumbbells? Oh goodness me….just about every major muscle group and functional movement pattern can be worked out using dumbbells. If you don’t have a ton of money to invest in a complete home gym, you don’t have ton of space to devote to lots of home gym equipment, or you’re simply a minimalist, you can get almost everything you need from dumbbell-based strength training workouts. To break down just the essentials, you can do lower body pushing and lower body pulling by using your dumbbells to add resistance to squats, deadlifts, lunges, hip thrusts, dumbbell swings, and more. You can do upper body horizontal pushing by doing dumbbell chest press variations (ideally from any of several affordable home weight bench options to allow you to work full range of motion and multiple pressing angles). Upper body vertical pushing is accomplished with dumbbells through overhead press variations. Upper body horizontal pulling is trained through dumbbell row variations. You can also add resistance to tons of core exercises such as sit ups, get ups, crunches, back extensions, and many more to carve out your abs and back muscles while becoming more stable and preventing back injuries. The only fundamental movement pattern that cannot be effectively trained through dumbbell-based workouts is upper body vertical pulling (think pull ups and pull downs). But with the addition of a simple doorframe pull up bar (and some bands such as Monster Bands if you can’t do sets with your own body weight), you can get an amazing full body workout on the CHEAP simply by investing in dumbbells of appropriate weights! Any self-respecting home gym or personal training studio needs to have a full set of dumbbells at the ready. Don’t mess around with dozens of expensive, space-cluttering individual dumbbells when you can choose from any number of quality adjustable dumbbell sets, five of the best and most affordable I’ve detailed above. Though the initial investment is more than if you bought a few sets of individual dumbbells in random weights to start, springing for an adjustable dumbbell set is well worth it because you’ll thank yourself later. Adjustable sets save a ton of space, time, money, and hassle in the long run. You’ll make better progress in terms of gaining strength, muscle mass & tone, and burning body fat if you can appropriately apply the principles of progressive overload to each of your dumbbell exercises. 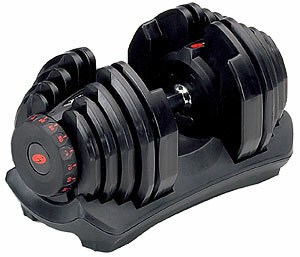 I hope you enjoyed my look at the top 5 best adjustable dumbbells sets. 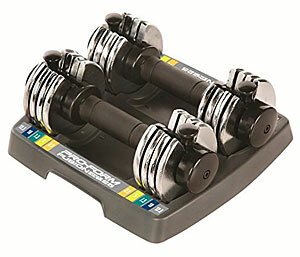 What adjustable dumbbells sets are your favorite? Let me know in the comments below!